Due to my peripheral neuropathy playing steel string instruments is often uncomfortable. More recently I've been focusing on playing Ukuleles and a Flesher Tack Head Minstrel Banjo all of which have nylon or nylgut strings. 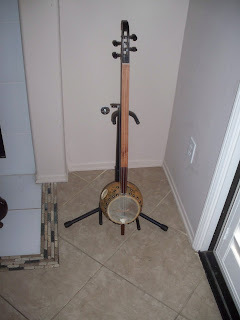 On December 26th of 2009 I spent some of my Christmas money by ordering a Gourd Banjo available from The Banjo Factory Website. Quoting John Salicco "my objective is not to produce absolutely historically accurate facsimiles. I'm trying to produce a sturdy playable fretless banjo that has the right general 19th Century look and feel, but at a price that almost anyone can afford". After a short three week wait the banjo arrived. I found it well constructed and was pleased with its appearance. It came with a nice cloth carrying case. I found the action at the nut a bit too high for me, but this was an easy fix. For Minstrel Style Banjo playing I like a wider spacing of strings so I also replaced the bridge. This banjo was quite a bargain costing only $260. I chose the Stichter peg head option as can be seen in the picture above. In a short time I was playing some Minstrel Banjo Tunes and really enjoyed the deep sounds of the low tuning (2 1/2 steps lower than clawhammer). I'm working on getting used to the smaller (9 1/2 inch) pot size. I also need to be able to adjust to the additional depth of the gourd and better control how to hold the banjo. Here's the link to The Banjo Factory. 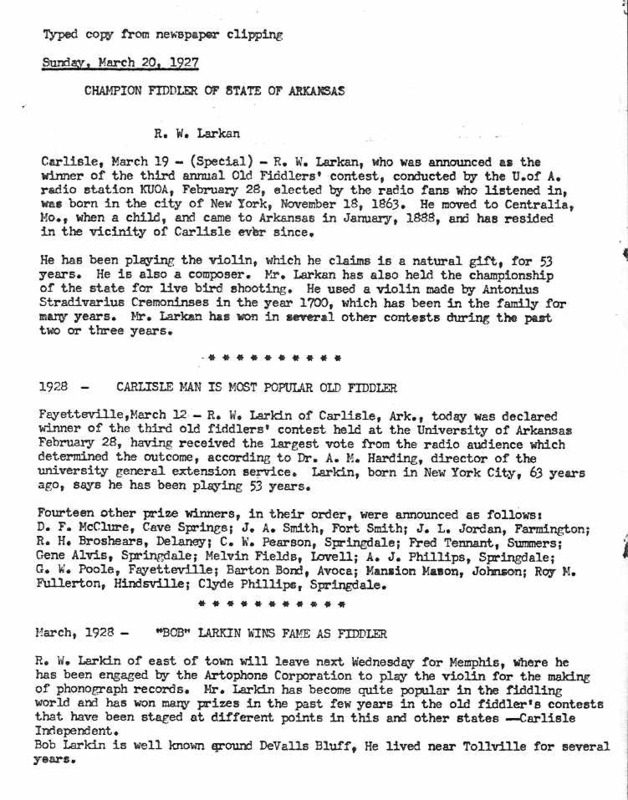 Minstrel Banjo playing does not have an oral tradition and was no longer popular by the time records were being made. 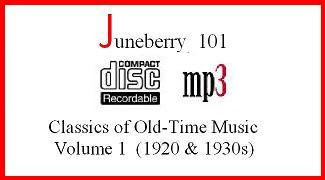 Today's players play tunes learned from various Banjo Books published in the mid 1800s. Fortunately the tunes are available today in tablature. Bob Flesher has some on his Dr Horsehair website. I will say the tab arrangements are quite good. Bob has some excellent CDs & a DVD video with a full band of this music also available through the Dr Horsehair site. Rounder Records released the Minstrel Banjo Style CD in 1994 with some of the top Minstrel Banjo players at that time. If you are a 5 string clawhammer player I'm sure you will enjoy learning Minstrel Banjo. 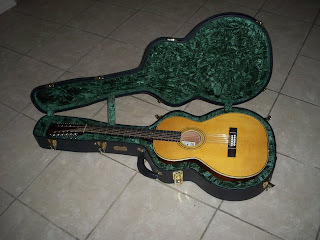 You can start by using your steel string fretted instrument but you will enjoy it even more with a fretless nylgut or gut string instrument in the lower tunings such as those offered by the Banjo Factory. 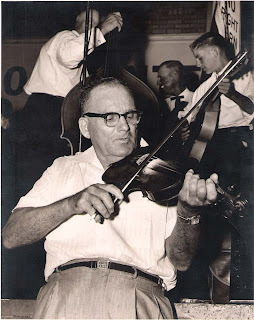 Bob Flesher also makes Old Time Minstrel and Clawhammer Banjos. You can also get a Gourd or Minstrel Banjo and play the tunes you already know. You will be sure to enjoy the lower pitched versions of your favorites. 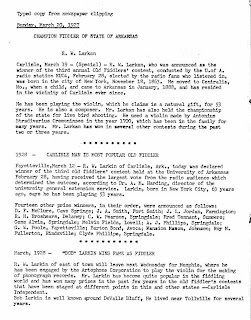 Here are links to Dr. Horsehair's Music Company. and to Bob Flesher Custom Banjos. The Banjo Clubhouse hosted by Tim Twiss is an excellent resource for learning about Minstrel Banjo playing. Tim and other players provides both audio and video examples from various books of the period. A number of different banjos and are heard in the audio examples and seen in the videos. Note: instead of the front page of a book there is one icon of a banjo (which happens to be a Gourd Banjo). 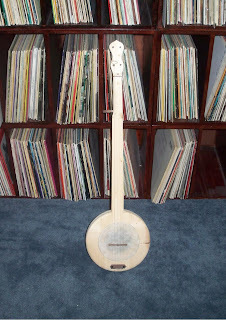 All of the audio examples found through that link are played on a Gourd Banjo. Here's the link to The Banjo Clubhouse.